It takes a little finesse to fillet the rind away from both the soft pink interior and the hard green exterior of fresh watermelon. But once separated, blanched, and pickled, the rind is a soft, tart accompaniment begging to be mixed with fresh watermelon, feta, and tomatoes for a summer salad. You can also mix the rind with a little red onion and cabbage for a summer slaw to accompany fried chicken or grilled quail. 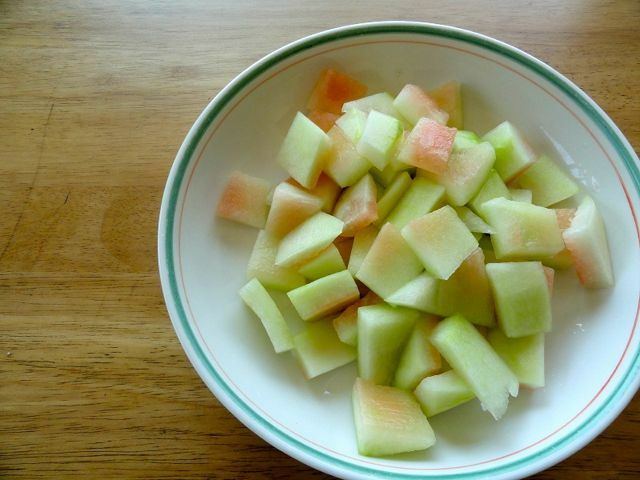 Remove as much of the pink flesh and green outer rind from the watermelon. Cube the rind and place in a pot of water. Bring to a boil and cook until fork-tender, about 10 minutes. Rinse and set aside. Bring the vinegar, water, sugar, and salt to a boil. Boil until the sugar is dissolved. Remove the pickling liquid from the heat and pour over the blanched rind. Put into fridge and let sit for 12 to 24 hours. The rind can be left in the liquid for longer and should hold for a week or two.